Majoring in English at the University of Oregon offers more than ever! English is both a traditional subject and a discipline that is paving the way for positive, real-world change. Did you know that English majors at the UO can take courses in comics and cartoons, film, the Internet, and television? Did you know that English offers courses in digital humanities (the study of literature and technology), environmental studies, disability studies, children’s literature, and science fiction? Did you know that the UO English Department ranks in the top 20 programs in the country for “return on investment?” Did you know that you can take courses in which the final exam involves playing a game? The University of Oregon’s English department offers a range of exciting courses and opportunities for students interested in the world around them. At the UO, you’ll take classes that cover many historical periods, literary traditions, and new kinds of texts. You can study eighteenth-century literature, Native American film, or cyber culture, writing and literary criticism, ethnic and world literatures, film studies, folklore studies, and gender studies. The department’s offerings are both practical and fun! Our students get jobs in every field, from high tech to health care and public relations to law. English majors learn how to read, write, think, and reason. In fact, our grads go on to earn, on average, higher salaries than any other humanities or social sciences major in the College of Arts and Sciences over the course of their careers. But don’t take our word for it—get the data here. Explore the breadth and political activism of literature and culture. Deepen your sensitivity to language. Equip yourself with writing, speaking, and critical thinking skills. If you like reading, writing, and thinking creatively and you want to make a difference in the world, the English major is a perfect fit. Our curriculum focuses on film, folklore, environmental literature, ethnic literatures, medieval studies, rhetoric and composition, literary theory, and women’s literature. The English department’s minor in Writing, Speaking, and Critical Reasoning offers students a program of courses that strengthen their abilities in all three areas. The interdisciplinary Comics and Cartoon Studies minor, the first of its kind in the United States, presents students with an international, historical, and critical perspective on the art of comics, from editorial cartoons to comic books to graphic novels. The department offers internships for students interested in teaching careers through courses on teen and children’s literature and theories of literacy, which provide the chance to work with children in local schools and adult learners in public and private agencies. Introduction to Comics Studies introduces students to the art of comics and to the methodologies of this new academic discipline. Students are exposed to a spectrum of comic-art forms and a historical range of comic texts, from (at least) the early 1900s to the present. Race and Representation in Film incorporates the viewing, interpreting, and analyzing films from developing non-European cultures and by people of color in the United States. American Popular Literature and Culture surveys cultural aesthetics reflected in historical romances, dime novels, detective fiction, westerns, and new journalism as expressions of the American experience. Literature and the Environment examines relationships between literature and the natural world. Students “read” nature from a literary perspective and read literature from an ecological perspective. Introduction to African American Literature guides students in the critical analysis of African American fiction, poetry, and drama from a historical perspective. New Media & Digital Culture: Games as Theory and Culture explores some of the most influential ideas and exciting developments of the twentieth and twenty-first centuries related to games of all kinds, from board games to video games to sporting contests and everything in between. This course provides opportunities to develop insight into the nature of games both as important cultural phenomenon and burgeoning economic industry, and to craft a game as a final project. You can view or download syllabi for these and other exciting courses offered by the English department. The English department offers a study abroad program in Galway, Ireland. 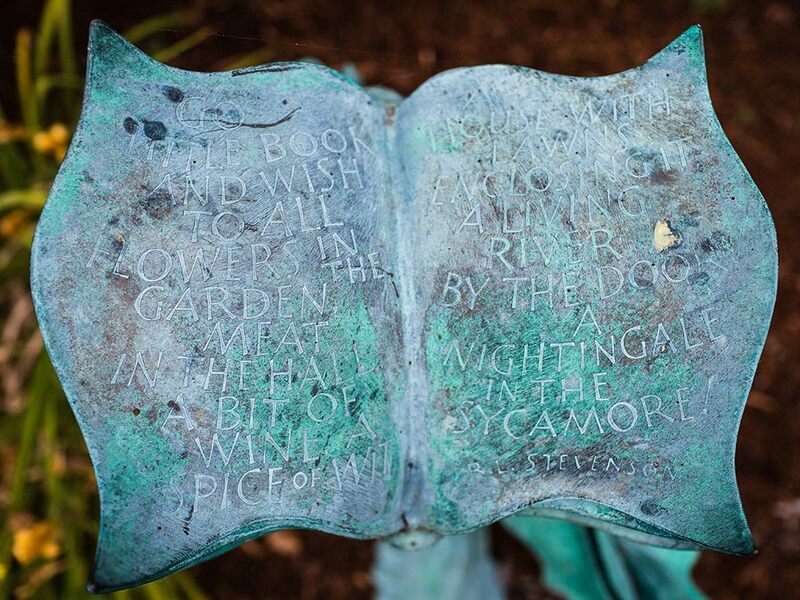 Ireland’s sprawling countryside is the backdrop as you visit locations where some of Europe’s most famous and inspiring literary pieces were written. Vivian J. Kim’s English major pursuit began with a fairy tale class offered by the Scandinavian department, but through the English department she found that ‘happily ever after’ was merely the beginning to never-ending analytical discoveries. She learned a single novel has the ability to address political, social, gender, historical, and scientific issues. “By reading hundreds of works, I became more than someone who likes to read and instead a reader who loves to examine and discover the possibilities of words. All of which I couldn't have done without the expertise of the faculty in the English department.” She hopes to join them one day in teaching curious undergraduates who want to unravel written works. Be part of an inclusive, inspiring, and exciting community beyond the classroom. The English Undergraduate Organization supports a range of academic, professional, social, and artistic activities for undergraduates such as the UO Poetry Slam, the Think.Play gaming group, Unbound, Art Ducko, and the Alpha Tau Phi Chapter of Sigma Tau Delta, International English Honor Society. Get to know other English majors and minors, attend social events, reading groups, academic and professional workshops, poetry slams, and more! Professor Ben Saunders’ training was in Renaissance and Early Modern studies. But after his first book he began incorporating his lifelong passion for comics and cartoons into his teaching. Professor Saunders now heads the Comic and Cartoon Studies minor and, in addition to his courses on Early Modern literature, now offers a full range of courses on superheroes and other graphic narratives. He has curated several symposiums on popular cartoon artwork, including a recent exhibit on Charles Schulz’s Peanuts at the Jordan Schnitzer Museum of Art. Recent classes he has taught include the History of the Superhero, Shakespeare, and Seventeenth-Century Poetry and Prose. For Assistant Professor Kirby Brown it was the beautiful setting and growing Native American student community that drew him to the UO. Even though he is one of the department’s newest members, he has already made an impact by teaching classes in Native American literature, organizing events and exhibits, and developing more opportunities for the UO’s diverse community. In Brown’s classes, students facilitate discussions, compose reading journals, and discuss topics with their fellow classmates. Brown recently won an ACLS writing fellowship, and a chapter in his dissertation, Stoking the Fire: Nationhood in Early Twentieth-Century Cherokee Writing, won the Essay of the Year Award from the Western Literature Association. Tara Fickle’s research interests include Asian and Asian American literature, Game Studies, twentieth and twenty-first century literature, American literature, Ethnic literature, the Digital Humanities, Graphic Fiction, and children’s literature. Her current project, “Serious Play: Asian America and the Gamification of Race,” argues for the centrality of games both literal and metaphorical to minority American literature. Professor Fickle regularly teaches courses on comics, video games, and ethnic American literature. The department’s curriculum offers vital skills that will prepare you for today’s fast-paced business and professional careers. You’ll also get great training for further academic work or artistic endeavors. UO English students graduate with strong backgrounds in critical reasoning and writing that complement any career. Our graduates have taken jobs in many fields, including law, government, journalism, medicine, teaching, management, social and environmental justice, publishing, advertising, cinematic production, and advanced technology.